The Archdiocese of Boston yesterday reached a tentative agreement with lawyers representing more than 500 people who say they were sexually abused by priests in which the church would pay the plaintiffs $85 million, the largest single amount ever in a case of clergy sexual abuse. The agreement marked the dramatic conclusion to Archbishop Sean P. O'Malley's all-out push in his first weeks in Boston to bring closure to the abuse cases that made this the epicenter of what many consider the gravest crisis in the history of the Roman Catholic Church in America. Under the agreement, the settlement will become final if 80 percent of 552 plaintiffs accept the offer within 37 days. All but a handful of the plaintiffs would be paid between $80,000 and $300,000, with the amounts set in binding arbitration overseen by Paul A. Finn, the mediator who oversaw the negotiations that led to the agreement. It was at the Brockton offices of Finn's company, Commonwealth Mediation and Conciliation, that O'Malley on Sunday night delivered his final offer to a steering committee of eight plaintiff lawyers, declaring that $85 million, $30 million more than an initial offer made four weeks before, was all the church could afford. Plaintiff attorneys credited O'Malley's personal involvement in the negotiations, and his growing credibility in the eyes of abuse victims, with making an amicable agreement possible. The steering committee recommended yesterday that the alleged victims, represented by more than 40 lawyers, accept the offer, and several lawyers said they expected the majority of their clients will do so. But it remained unclear whether enough will sign on to finalize the settlement. Lawyers for alleged victims said the deal would hold even if the number agreeing was less than 80 percent, but the amount would be reduced proportionately by each person who opts out and decides to pursue a trial. O'Malley is seeking a swift end to a crisis that led to the resignation of his predecessor, Cardinal Bernard F. Law, and caused deep questioning among the metropolitan area's 2 million Catholics about the credibility of a church hierarchy that allowed decades of abuse of children to go unreported to authorities. It also led to a stinging report by Attorney General Thomas F. Reilly, who accused Law and his subordinates of covering up crimes and said they avoided indictment only because laws at the time didn't cover such negligence. Besides money, the agreement calls for the archdiocese to include victims of sexual abuse on the boards and panels it has established to monitor abuse, to offer victims "spritual direction and spiritual counseling services," and to keep information about counseling and treatment it offers to victims confidential. The actual amount paid to the plaintiffs would be slightly more than $84 million, as the agreement calls for $750,000 to reimburse lawyers for costs. Lawyers typically get a contingency fee of one-third, meaning that attorneys will split about $28 million, leaving about $56 million for the alleged victims. The largest individual payments would go to approximately 200 people who say they were raped or sodomized. Lesser amounts would go to some 300 people who say they were fondled, while $20,000 would be paid to each of the 29 parents who claim a loss of consortium because their children were abused. If approved, the settlement will bring to $110 million the amount the cash-strapped archdiocese has spent to settle claims against abusive clergy since 1990. While the amount offered would mark the largest single settlement for a group of cases of clergy sexual abuse, the per-victim amount would be relatively low when compared with other cases nationwide. Analyzing other cases, plaintiff attorneys had calculated that between $90 million and $120 million was fair compensation for the more than 500 alleged victims. A pair of analysts with a victims' advocacy group, Survivors First, said the $94,000 that victims will receive on average under yesterday's agreement is the fifth-lowest of 15 other settlements that they analyzed. For example, analysts at BishopAccountability.org noted, the 36 victims who agreed to a settlement with the diocese of Providence last year will receive an average $225,000. Yet the Boston settlement is not nearly the leanest. Under a deal signed by the Louisville, Ky., diocese this year, 243 victims will receive an average of $67,000, and the 176 victims who settled with the Manchester, N.H., diocese this year will receive an average of $53,000. Comparing average amounts in such settlements can be misleading, however, as the severity of abuse varies enormously from case to case. "The agreement we reached had nothing to do with settlements elsewhere," said Roderick MacLeish Jr., whose law firm Greenberg Traurig represented about half of the Boston victims. "This is what the archdiocese was able to pay at the same time as bringing justice to our clients." O'Malley was in Washington, D.C., yesterday and did not speak publicly about the agreement. But the Rev. Christopher J. Coyne, spokesman for the archdiocese, told reporters the church was pleased the agreement had been reached. "Our actions say we admit our mistakes, we've learned from our mistakes, and we're doing everything we can to make sure that they never happen again," Coyne said. "It's a good day for the archdiocese and we haven't had too many over the past couple of years," Coyne added. "But this is one and I think many of us can take some consolation in this day and continue to pray that what has happened here can be a good start for the future healing that we need." The tentative agreement followed two marathon bargaining sessions, one of which was attended by O'Malley, who on Sunday night underlined the finality of the $85 million offer by telling plaintiff lawyers, "Our credit cards are maxed out." Finn convened the Sunday night meeting at his offices after a highly anticipated Saturday mediation session, at which O'Malley was scheduled to make a direct appeal to a group of about 10 alleged victims, was cancelled because of squabbling between plaintiff attorneys. The Sunday night session began at about 6 p.m. and dragged on until about 12:30 a.m., as the two sides hashed out mostly nonfinancial items, including the timing of when the money would be paid. At about midnight, attorney Jeffrey A. Newman, a steering committee member whose firm Greenberg Traurig represents about 260 of the alleged victims, went to give O'Malley a document and found the prelate resting his head on a table. "He was tired," said Newman. "We all were tired." Despite his fatigue, O'Malley was credited with providing much of the final push to get the tentative agreement, just seven weeks after he was installed as the sixth archbishop of Boston. "The archbishop's presence on Sunday was very helpful. He created a whole different tone," said Newman. Thomas H. Hannigan Jr., O'Malley's lawyer, agreed. "The pivotal moment was the archbishop's decision to participate directly, to meet with the plaintiff lawyers and have a candid exchange. I think it broke the back of the negotiations," said Hannigan. While praising O'Malley, Newman's colleague, attorney Robert Sherman, also credited Finn for his persistence and his tactical finesse. Finn had presided over several other successful mediations involving cases of clergy sexual abuse, including those in the Fall River diocese when O'Malley headed it in 1992. "We were under house arrest Sunday night," said Sherman. "Paul Finn provided no food, no drinks. I know it was deliberate because when you get tired and hungry you get awfully reasonable, awfully fast." O'Malley was able to convince the steering committee representing the plaintiffs that the archdiocese was, as he put it, "maxed out" when it came to offering $85 million. That figure was $30 million more than the original $55 million O'Malley offered Aug. 8 to settle the claims. O'Malley upped the offer to $65 million two weeks ago, and to $75 million last Friday, lawyers said. O'Malley told the steering committee that the archdiocese had prepared a financial analysis that concluded that $85 million was all the archdiocese could raise between loans and the sale of church property. According to Sherman, O'Malley said no insurance money was being used, and Newman said the insurance companies were refusing to pay. O'Malley said anything more than $85 million could bankrupt the archdiocese, Sherman said. It remains possible that Hannigan, the lawyer whom O'Malley named the day after his July 30 installation as the archdiocese's lead attorney for the sexual abuse cases, will sue the insurance companies to recoup some of the money. Hannigan successfully sued the insurance company that refused to cover an estimated $5 million settlement that O'Malley reached in 1992 with more than 100 alleged victims of a former priest in the Fall River diocese O'Malley headed until last year. O'Malley's presentation Sunday night was apparently persuasive, because lawyers said they spent as much time negotiating when the money was to be paid, and who would set the individual amounts, as whether the total amount was all he could offer. "We believed him because everything he has shown us since he got here is that, unlike Cardinal Law, he is honest and sincere," said Carmen L. Durso, a lawyer on the steering committee. The archdiocese wanted to pay the settlement over 15 months, but the plaintiff lawyers were insistent that the money be paid by the end of the year. In the end, the archdiocese agreed to pay by Dec. 22. The archdiocese made other concessions to close the deal, including dropping from 95 to 80 percent the number of plaintiffs who had to sign on to finalize the settlement, while offering to negotiate an even smaller number. The plaintiffs offered their own concessions, including their dropping a demand that the settlement include a provision to build a memorial in honor of victims. It was in O'Malley's absence Monday afternoon, when the bargaining session resumed at the One International Place offices of Hannigan's law firm, Ropes & Gray, that O'Malley's secretary, the Rev. John J. Connolly, assumed a key role in the negotiations. As O'Malley prepared to travel to a US Conference of Catholic Bishops committee meeting in Washington, Connolly convinced the plaintiff lawyers that mandating construction of a memorial was something the archdiocese fundamentally opposed. The plaintiffs conceded that argument to Connolly, but Connolly sided with the plaintiffs when Hannigan insisted that any plaintiff who signed off on the agreement would have to give up any claims against other priests in other dioceses. "John agreed with us that that wasn't fair," said Newman. "John Connolly was very helpful in the end." Monday's session began at about 2 p.m. and lasted until about 10:30 p.m. Lawyers gathered at Hannigan's office again yesterday morning to hash out a few unresolved matters before they began trying to sell the deal to their clients. Many lawyers were confident they could persuade their clients that the deal was the best they can get. "Most of our clients are comfortable with it," said Newman. It remained unclear what plaintiff lawyers and the archdiocese considered the minimum figure for how many victims must agree. "The 80 percent figure is not a game breaker," said Newman. "But if only 50 percent accept it, we have real trouble." Yesterday afternoon, lawyers in the case privately briefed Superior Court Judge Constance M. Sweeney, who is overseeing the case, on the agreement. Later, at a public hearing, plaintiff lawyer William H. Gordon said, "We can announce today to the court that . . . we have a framework for settlement." Gordon acknowledged that the plaintiffs will receive, on average, less than the 86 alleged victims of Rev. John J. Geoghan who settled with the archdiocese last year for $10 million. But unlike that deal, he said, this agreement allows victims to continue to receive counseling paid for by the archdiocese. Sweeney spoke only briefly to the lawyers, thanking them and their clients for their hard work in reaching the tentative agreement. And for those plaintiffs who opt out of the agreement, she said, "The courthouse doors remain open and we will continue with the process." 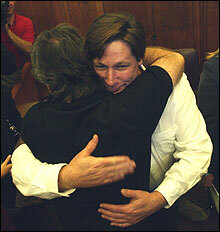 Outside the courtroom, Sherman explained that the agreement was not a cause for celebration. "This is not the ideal result, but this is the right result," said Sherman. "The ideal result would be to give people back their youthful innocence. We can only do what is humanly possible and I believe we've done that." Walter V. Robinson and Kathleen Burge of the Globe staff contributed to this report.